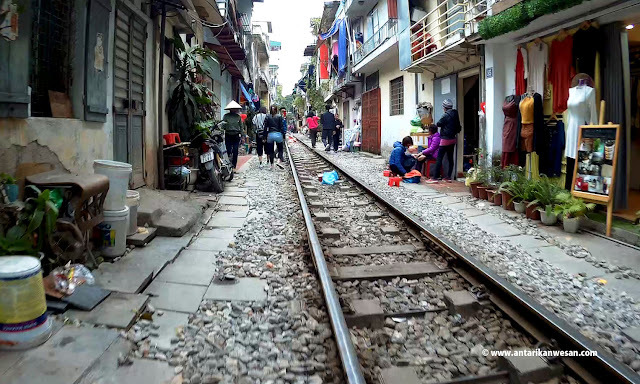 What if I told you there is a street in Hanoi where a train track passes between houses on both sides? Several trains pass through the track on a daily basis. Sounds dangerous? Welcome to the Train Street of Hanoi. It is, in reality, a simple train track that passes through a dense city neighborhood as it emerges out of Hanoi train station. And this is what makes it so interesting. There are houses on both sides with the street in between. The street is perhaps just 3 metres wide. Instead of motor vehicles, there is a train track running in the middle of it. Locals on motorbikes and cycles can be occasionally seen passing by on either side of the tracks. The residents of the houses can be seen sitting on the tracks, cutting vegetables or just chatting with the neighbours. For the kids, this entire stretch is perhaps their playground. There is just one thing- A few times through the day, a train passes on these tracks. The residents know of the train timings and promptly shift their business inside the house seconds before the mighty train chugs past, just a few inches away from their homes. The train goes and the locals’ life returns to the tracks, their very own backyard. This is not a tourist spot that you would find marked on any maps. Most tourists don’t even know of the existence of such a place. But the Train Street of Hanoi is fast becoming a tourist hotspot. It is fascinating to see a massive train brush past you, so close to the buildings, and that is attracting a lot of adventure loving tourists. I had read about the Hanoi train street online before my Vietnam trip and the crazy train buff in me had this place on priority, above the Ho Chi Minh Mausoleum, the Temple of Literature, the Hoa Lo Prison or even the Hoan Kiem Lake. I had to find the train street anyhow and witness a train passing through it. I asked my hostel receptionist about it and they roughly pointed me to an area on the city map. Google wasn’t helping much and there seemed to be a conflict between two spots- one to the north of Hanoi station and one to its south. The northern one was closer to my hostel and seemed like a longer stretch. So I decided to give it a try and catch the train that passes at 3.20 PM. I arrived by 2.45 PM and walked on the track. There were a few other tourists there, everyone waiting to catch a glimpse of the passing train. I even saw a small café. I think it was called ‘Train Street Café’ and served some juices and snacks. 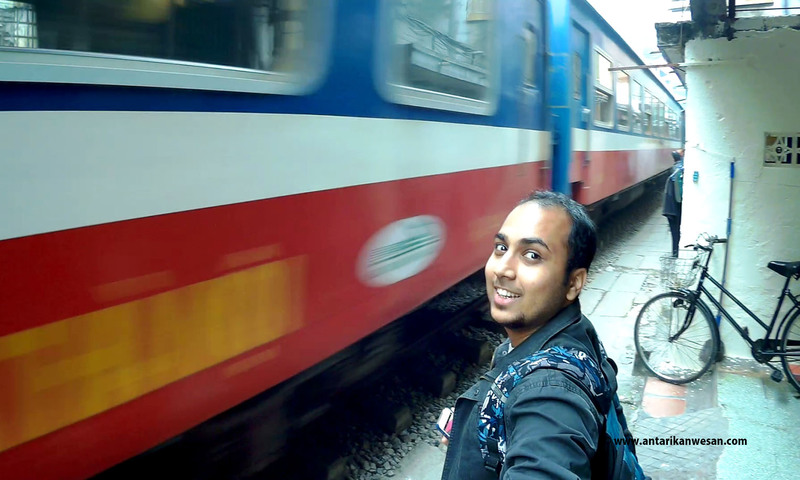 I just walked around clicking pictures and waiting for the train. As I mentioned earlier, there were two variations I read and heard about the location of the train street. Now I realize that it was because both exist. Check out this map and bookmark it if you like for the exact locations of both the streets. One is located to the north of Hanoi station and one is located to the immediate south of the station- both are highlighted with red lines. I would recommend visiting the one on the North as it is a much longer stretch. I found several versions of the train timings online including 6 AM, 11.37 AM, 3.20 PM, 5.45 PM, 6.27 PM and 9.15 PM (January 2018). I am not sure about all these timings. I went for the 3.20 PM train and was able to catch it on a Saturday leaving from Hanoi station towards the north. Do note that I went to the Northern stretch. All trains that go to Sapa take the Northern stretch. Trains going to the South towards Ho Chi Minh City or any of the places enroute, take the Southern route. I would recommend checking the train timings of a particular day (either online or by visiting Hanoi station) and deciding your visit to the Train Street accordingly. The timings are usually different for weekdays and weekends. Also, not all trains run all days of the week. While at the train street be careful of the direction the train is coming from. There definitely is a huge adrenaline rush as the train passes so close. It was definitely crazier than I had imagined it would be. For train lovers and adrenaline junkies, this is a must visit. Just stay safe and away from the tracks, the train won’t stop for your selfie or daredevil photo. The speed at which it passes, it mostly will run over you if you are not careful. In case you have been to the Train Street recently or are from Hanoi, do share the train timing if you are aware of it in the comments below. That's one cool thing to do when in Vietnam ..I ll definitely do this.